(Francisco Kjolseth | The Salt Lake Tribune) Syracuse head coach Jim Boeheim argues a call as Syracuse faces Baylor in their first round menÕs NCAA March Madness tournament game at Vivint Smart Home Arena in Salt Lake City on Thursday, March 21, 2019. (Francisco Kjolseth | The Salt Lake Tribune) Syracuse Orange forward Elijah Hughes (33) and Baylor Bears guard Makai Mason (10) battle over a ball as Syracuse faces Baylor in their first round menÕs NCAA March Madness tournament game at Vivint Smart Home Arena in Salt Lake City on Thursday, March 21, 2019. (Francisco Kjolseth | The Salt Lake Tribune) Syracuse Orange forward Elijah Hughes (33) gets between Baylor Bears guard Makai Mason (10) and Baylor Bears guard Jared Butler (12) as Syracuse faces Baylor in their first round menÕs NCAA March Madness tournament game at Vivint Smart Home Arena in Salt Lake City on Thursday, March 21, 2019. (Francisco Kjolseth | The Salt Lake Tribune) Baylor Bears guard Mario Kegler (4) battles for possession against Syracuse Orange guard Buddy Boeheim (35) as Syracuse faces Baylor in their first round menÕs NCAA March Madness tournament game at Vivint Smart Home Arena in Salt Lake City on Thursday, March 21, 2019. (Francisco Kjolseth | The Salt Lake Tribune) Baylor Bears guard Mark Vital (11) tries to push past Syracuse Orange center Paschal Chukwu (13) as Syracuse faces Baylor in their first round menÕs NCAA March Madness tournament game at Vivint Smart Home Arena in Salt Lake City on Thursday, March 21, 2019. (Francisco Kjolseth | The Salt Lake Tribune) Baylor head coach Scott Drew yell at his team as Syracuse faces Baylor in their first round menÕs NCAA March Madness tournament game at Vivint Smart Home Arena in Salt Lake City on Thursday, March 21, 2019. (Francisco Kjolseth | The Salt Lake Tribune) Syracuse fans celebrate a play as Syracuse faces Baylor in their first round menÕs NCAA March Madness tournament game at Vivint Smart Home Arena in Salt Lake City on Thursday, March 21, 2019. (Francisco Kjolseth | The Salt Lake Tribune) Baylor Bears guard Mario Kegler (4) tries to get one past Syracuse Orange forward Elijah Hughes (33) as Syracuse faces Baylor in their first round menÕs NCAA March Madness tournament game at Vivint Smart Home Arena in Salt Lake City on Thursday, March 21, 2019. (Francisco Kjolseth | The Salt Lake Tribune) Baylor Bears guard Mario Kegler (4) celebrates a three pointer as Syracuse faces Baylor in their first round menÕs NCAA March Madness tournament game at Vivint Smart Home Arena in Salt Lake City on Thursday, March 21, 2019. (Francisco Kjolseth | The Salt Lake Tribune) The Syracuse band makes some noise as Syracuse faces Baylor in their first round menÕs NCAA March Madness tournament game at Vivint Smart Home Arena in Salt Lake City on Thursday, March 21, 2019. (Francisco Kjolseth | The Salt Lake Tribune) Syracuse Orange forward Oshae Brissett (11) pulls down a ball as Syracuse faces Baylor in their first round menÕs NCAA March Madness tournament game at Vivint Smart Home Arena in Salt Lake City on Thursday, March 21, 2019. (Francisco Kjolseth | The Salt Lake Tribune) Syracuse Orange forward Marek Dolezaj (21) loses momentary control of the ball as Baylor Bears guard Jared Butler (12) gets a hand on the ball as Syracuse faces Baylor in their first round menÕs NCAA March Madness tournament game at Vivint Smart Home Arena in Salt Lake City on Thursday, March 21, 2019. 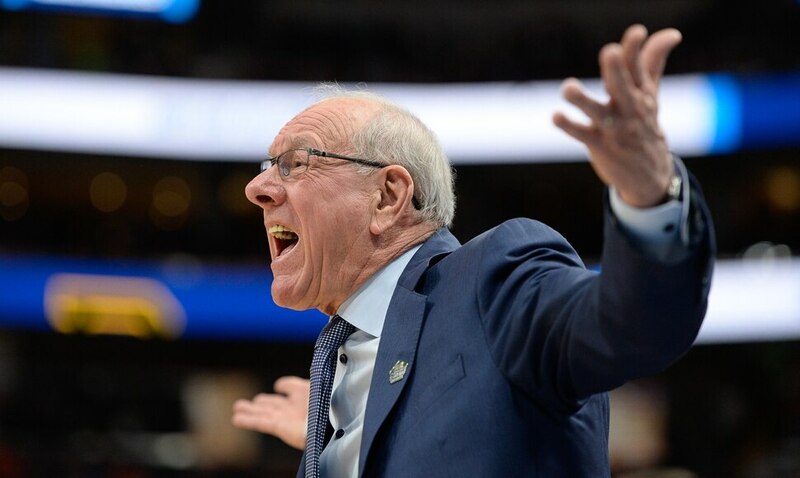 (Francisco Kjolseth | The Salt Lake Tribune) Syracuse head coach Jim Boeheim bears his teeth as Syracuse faces Baylor in their first round menÕs NCAA March Madness tournament game at Vivint Smart Home Arena in Salt Lake City on Thursday, March 21, 2019. (Francisco Kjolseth | The Salt Lake Tribune) Syracuse Orange forward Oshae Brissett (11) dunks one in past Baylor Bears forward Freddie Gillespie (33) as Syracuse faces Baylor in their first round menÕs NCAA March Madness tournament game at Vivint Smart Home Arena in Salt Lake City on Thursday, March 21, 2019. (Francisco Kjolseth | The Salt Lake Tribune) Baylor Bears guard Makai Mason (10) takes a moment to get back up as Syracuse faces Baylor in their first round menÕs NCAA March Madness tournament game at Vivint Smart Home Arena in Salt Lake City on Thursday, March 21, 2019. (Francisco Kjolseth | The Salt Lake Tribune) Baylor Bears guard Jared Butler (12) puts in a difficult shot past Syracuse Orange forward Marek Dolezaj (21) as Syracuse faces Baylor in their first round menÕs NCAA March Madness tournament game at Vivint Smart Home Arena in Salt Lake City on Thursday, March 21, 2019. (Francisco Kjolseth | The Salt Lake Tribune) Baylor Bears guard Jared Butler (12) screams in celebration after sinking a tough shot as Syracuse faces Baylor in their first round menÕs NCAA March Madness tournament game at Vivint Smart Home Arena in Salt Lake City on Thursday, March 21, 2019. (Francisco Kjolseth | The Salt Lake Tribune) Syracuse Orange forward Elijah Hughes (33) goes for a ride after pressure by Baylor Bears guard King McClure (3) as Syracuse faces Baylor in their first round menÕs NCAA March Madness tournament game at Vivint Smart Home Arena in Salt Lake City on Thursday, March 21, 2019. (Francisco Kjolseth | The Salt Lake Tribune) Syracuse Orange guard Buddy Boeheim (35) is mobbed by the Baylor defense as Syracuse faces Baylor in their first round menÕs NCAA March Madness tournament game at Vivint Smart Home Arena in Salt Lake City on Thursday, March 21, 2019. (Francisco Kjolseth | The Salt Lake Tribune) Syracuse Orange guard Tyus Battle (25) is held back by Baylor Bears guard King McClure (3) as Syracuse faces Baylor in their first round menÕs NCAA March Madness tournament game at Vivint Smart Home Arena in Salt Lake City on Thursday, March 21, 2019. (Francisco Kjolseth | The Salt Lake Tribune) Baylor Bears guard Jared Butler (12) and Syracuse Orange forward Marek Dolezaj (21) scramble for a ball as Syracuse faces Baylor in their first round menÕs NCAA March Madness tournament game at Vivint Smart Home Arena in Salt Lake City on Thursday, March 21, 2019. (Francisco Kjolseth | The Salt Lake Tribune) The Syracuse bench cheers on their team as Syracuse faces Baylor in their first round menÕs NCAA March Madness tournament game at Vivint Smart Home Arena in Salt Lake City on Thursday, March 21, 2019. (Francisco Kjolseth | The Salt Lake Tribune) Syracuse Orange center Paschal Chukwu (13) battles the Baylor defense as Syracuse faces Baylor in their first round menÕs NCAA March Madness tournament game at Vivint Smart Home Arena in Salt Lake City on Thursday, March 21, 2019. (Francisco Kjolseth | The Salt Lake Tribune) Syracuse Orange guard Tyus Battle (25) puts in a three pointer as Syracuse faces Baylor in their first round menÕs NCAA March Madness tournament game at Vivint Smart Home Arena in Salt Lake City on Thursday, March 21, 2019. 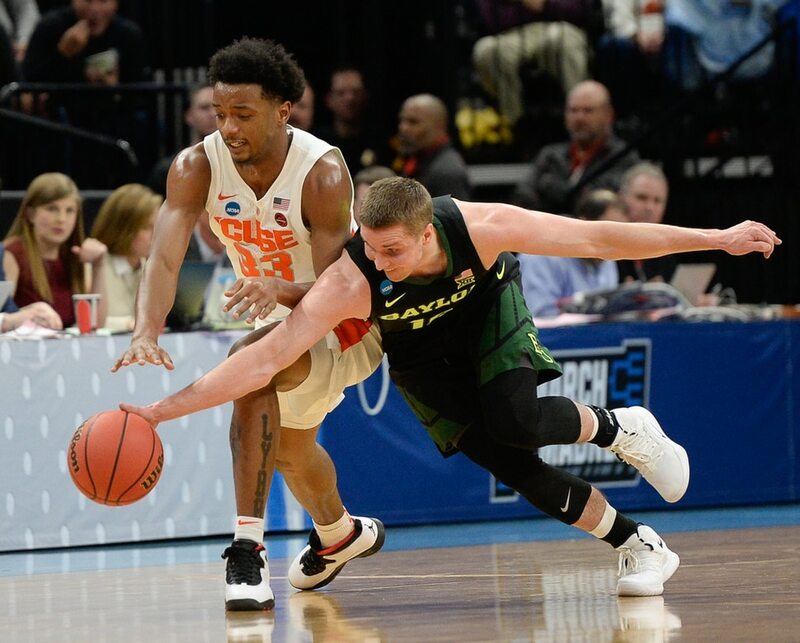 (Francisco Kjolseth | The Salt Lake Tribune) Baylor Bears guard Mark Vital (11) momentarily hurts his ankle as Syracuse faces Baylor in their first round menÕs NCAA March Madness tournament game at Vivint Smart Home Arena in Salt Lake City on Thursday, March 21, 2019. (Francisco Kjolseth | The Salt Lake Tribune) Syracuse Orange forward Elijah Hughes (33) is treated for a bloody nose as Syracuse faces Baylor in their first round menÕs NCAA March Madness tournament game at Vivint Smart Home Arena in Salt Lake City on Thursday, March 21, 2019. (Francisco Kjolseth | The Salt Lake Tribune) Baylor Bears guard Mario Kegler (4) celebrates a three pointer as Syracuse faces Baylor in their first round menÕs NCAA March Madness tournament game at Vivint Smart Home Arena in Salt Lake City on Thursday, March 21, 2019. (Francisco Kjolseth | The Salt Lake Tribune) The Syracuse and Baylor mascots face off in a dance battle in the first round menÕs NCAA March Madness tournament game at Vivint Smart Home Arena in Salt Lake City on Thursday, March 21, 2019. (Francisco Kjolseth | The Salt Lake Tribune) Syracuse Orange guard Tyus Battle (25) dunks the ball as Syracuse faces Baylor in their first round menÕs NCAA March Madness tournament game at Vivint Smart Home Arena in Salt Lake City on Thursday, March 21, 2019. (Francisco Kjolseth | The Salt Lake Tribune) Baylor Bears guard Jared Butler (12) and Syracuse Orange forward Marek Dolezaj (21) scramble for a ball as Syracuse faces Baylor in their first round menÕs NCAA March Madness tournament game at Vivint Smart Home Arena in Salt Lake City on Thursday, March 21, 2019. (Francisco Kjolseth | The Salt Lake Tribune) Syracuse Orange guard Tyus Battle (25) shows his disappointment after losing to Baylor in their first round menÕs NCAA March Madness tournament game at Vivint Smart Home Arena in Salt Lake City on Thursday, March 21, 2019. (Francisco Kjolseth | The Salt Lake Tribune) Baylor celebrates their win over Syracuse as Syracuse faces Baylor in their first round menÕs NCAA March Madness tournament game at Vivint Smart Home Arena in Salt Lake City on Thursday, March 21, 2019. (Francisco Kjolseth | The Salt Lake Tribune) Baylor senior Jake Lindsey joins his team as the Bears beat Syracuse in the first round of the NCAA Tournament, Thursday in Salt Lake City. Lindsay, who went to nearby Olympus High, is the son of Utah Jazz general manager Dennis Lindsay. The first clues that this would be Baylor's night came before the first media timeout Thursday, when the Bears made six 3-pointers. Nothing quite like that flurry continued all game long, but the theme remained intact. Baylor's shooting made the difference in a 78-69 victory over Syracuse, sending the Bears into the second round of the NCAA Tournament's West Region at Vivint Smart Home Arena. No. 9-seeded Baylor will meet No. 1 Gonzaga on Saturday (5:10 p.m. MDT), after a battle with Syracuse that seemingly could have gone either way, until the Bears took command midway through the second half. Baylor thrived against Syracuse's renowned zone defense, going 16 of 34 from 3-point range. And a team that entered the tournament with four straight losses showed poise in the end. Baylor guard Makai Mason scored 16 of his 22 points in the first half; Syracuse forward Elijah Hughes scored 18 of his 25 points in those first 20 minutes of terrific offensive basketball between two teams that actually do play defense. Syracuse played without suspended point guard Frank Howard, whose defensive ability may have been missed. “We couldn't stop their offense and they couldn't stop ours,” said Syracuse coach Jim Boeheim. “I'm an offensive coach, so I liked it,” said Baylor coach Scott Drew, who said he authorized his team to take up to 40 3-point shots against the Orange. • After a second half with 12 lead changes, Baylor beats Syracuse 78-69 in Thursday’s late game at Vivint Smart Home Arena. • Each team makes seven 3-pointers in the game’s first 13:06. • Baylor alumnus Dennis Lindsey, the Jazz’s general manager, watches the game from behind the Bears’ bench. Mason once beat Baylor in the NCAA Tournament as a Yale guard, and then he led the Bears to a win on this stage. “You can't write a better story,” he said. The Bears led 38-37 in a display of modern basketball, as Baylor and Syracuse each attempted five 2-point shots in the first half, making three. The teams extended their defenses in the second half, leading to fewer 3-point shots. But a 3-pointer by Baylor's Jared Butler gave the Bears a 65-58 lead, and they stayed in control. Something like this happens every time Syracuse comes to Salt Lake City. The Orange lost to Butler University in the 2010 Sweet 16 at Vivint, fading late in the game. This time, Jared Butler helped beat them, finishing with 14 points. Baylor has made a season's theme of rising above a ninth-place forecast in the 10-team Big 12, and Drew and his players talked about that subject again Thursday. They've overcome injuries to advance to this point of the NCAA Tournament, facing an even bigger challenge Saturday against Gonzaga. Drew's brother Bryce brought Vanderbilt to Vivint two years ago, losing to Northwestern in a first-round game. Northwestern advanced to play Gonzaga in 2017, and now Scott Drew's team gets that opportunity. It almost was that simple. Syracuse went 9 of 29 from the field in the second half; Baylor shot 15 of 29.